Ms. Voncille finds her way home. I got an email this morning from a woman in Texas who informed me the boat was named after her mother, Voncille. Here's an excerpt. called Port Isabel. So sweet to see her sitting there in Bayou la Batre." 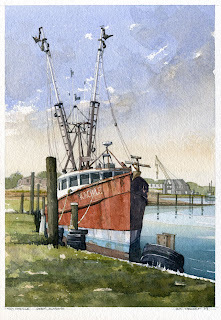 So, last August, I'm in Bayou la Batre looking for boats as subjects for my work and the 2nd one I actually do a painting of is named after another watercolor painter and her daughter finds this painting on my artbreak page. Small world, big web. Great morning.